The numbers were down a little with late Spring holidays featuring but nonetheless a good evenings sail that leaves the series in both classes delicately poised. Moby Jay sailing double handed did a great SOOD job setting a dead run in the northerly breeze down to Kemps Quay followed by a reach to Mother Bank and an upwind home. Sadly this is the last time we are likely to see Moby Jay out on a Wednesday as her destiny lies across the channel. Nice racing against you guys! 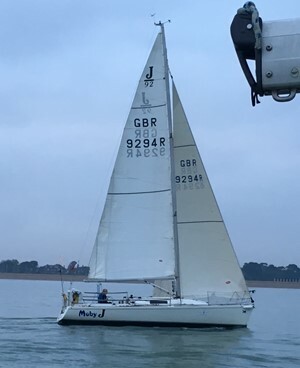 Start one at 1830 saw the whole fleet opting for a spinnaker hoist on port gybe at Darling Associates whereas start 2 opted for starboard gybe. In the end it appeared to make little difference although both Sunshine and Tinker T laid the leeward mark without needing to gybe. On the close reach to Mother Bank Moonfleet demonstrated that if you carry too much headsail the boat will still luff sharply in the gusts, however it is all a learning curve at the moment and the performance is improving. At the start of the beat in the faster class Sunshine was a few boat lengths ahead of Tinker T and TT was a few ahead of Jolly Jack Tar. Such is the pace these faster boats generate upwind that both Sunshine and JJT saved their time on this relatively short final beat with the tide assisting. Sunshine eventually just taking the honours from JJT with seconds in it. Danegeld although having a bit of a mare at times took the NHC bullet. It is still all to play for in the final race of the series next week with 2 points separating the top three in IRC and one point between the top two in NHC. Finally well done Wizard last week in taking the win which went unacknowledged as yours truly managed to input her time incorrectly by 10 mins!